While first-party sales (the sale of inventory Amazon itself sells) grew 25% compounded annually since 1999, third-party sales (items sold by merchants on the platform) grew 52%, he explained. That compares to eBay's compound growth rate of 20% in the same period, according to Bezos's calculations - $160 billion for Amazon third-party sales in 2018, compared to $95 billion for eBay. "While I appreciate the ink dedicated to @ebay from the ceo of the company not focused on competition, think I'll dedicate my letter to customers, purpose and strategy. We don't compete with our sellers. We don't bundle endless services to create barriers to competition." In Jeff Bezos's letter to Amazon shareholders, he addressed the questions, "Why did independent sellers do so much better selling on Amazon than they did on eBay? And why were independent sellers able to grow so much faster than Amazon's own highly organized first-party sales organization? Interestingly, he said Amazon invested in offering merchants the "very best selling tools" it could imagine and build. And particularly important to helping sellers: Fulfillment by Amazon (FBA) and the Prime membership program. It's out-of-character for Amazon's founder to specifically call out a rival by name, indicating this is not the same Jeff Bezos of Amazon's early years. The CEO has found his company in the spotlight politically, and his personal life has also been under the microscope as of late. Today's release of the Amazon shareholder letter calls into question whether Bezos really did ignore competitors all those years, but makes it clear he's paying attention now, in a rather self-congratulatory manner. 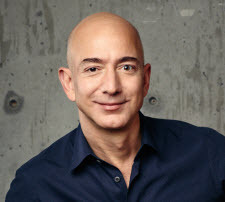 Jeff Bezos - A self made BIllionare who started with nothing and worked his way up on his own. David Wenig - A greedy hack who rode his father's coat tails to get to where he is. Getting 'hired' rather than building a business. DW is not even in the same universe as Bezos and should apologize for assuming he is and remove the tweet in shame. Well I received an email from Amazon this morning and they will soon be charging SALES TAX on fees. As of June 1st. I'm betting we are going to see something like this coming soon from other sites as well. Bezo's didn't say anything that everyone already knows. Amazon has always kicked Greedbays arse. Of course they are on top, they got some steller special government treatment. If it wasn't for tax payers, they'd have went bankrupt years ago when they could never get out of the red. First Elliott Management, and now Jeff Bezos. Devin must be sweating. Hopefully Jeff's message will be heard loud and clear by the Board of Directors and Devin will be kicked to the curb soon. Sales tax on fees? I'm afraid to ask what's next. I live in Canada, but sell on eBay.com. eBay has been charging Canadian GST (Goods and Services Tax) of 5% on the fees they charge me for some time now. I expect at some point we will be charged sales tax on the tips we leave in restaurants. ""We don't compete with our sellers. We don't bundle endless services to create barriers to competition."" Wow. I don't think even POTUS could get away with this kind of a bald faced lie. Meanwhile, consider this: it's not what the 'venues' are doing or not doing that is resulting in an order of magnitude difference in venue sales - though clearly those are contributing factors. It's what the buyers are choosing in spite of all those factors that might be identified as disagreeable. I thought I was reading it wrong when I got that email. Charging taxes on fees, insane! But I guess we have to pay for trumps corporate tax cuts somehow. I have to laugh at Wenig's twitter response. Wenig didn't mention the countless technical glitches on ebay, the hiding of sellers listings, the commission on shipping and the other serious issues from ebay. Please leave eBay for Amazon, I'll shut the eBay door for you. . . .
if wenig had a clue about online selling he would have said something like "impressive considering the number of gated categories there are on amazon, i guess those sellers will just have to come here"
"impressive considering the number of gated categories there are on amazon, i guess those sellers will just have to come here"
Devin could use you on his team. . . .
iheartjacksparrow, I had not thought about his comments from that perspective. That makes his comments golden to me. And if Wenig actually did respond on Twitter the counter attack ripple effect was likely that of a snow pea being thrown into the ocean. But Amazon DOESN'T make 30 times the profit eBay does. For being 30 times larger they only make 5 times the profit. eBay makes most of it's money from advertising, Amazon makes most of it's money form cloud storage services. . .Neither are focused on internet sales for the long haul. Financial wizardry lives. LOL And Ivanka is good with numbers so put her in charge of The World Bank. humm - could this latest comment be deflecting his favored child statue due to his lack of moral character? Has he suffered a decline since the news of his infidelity has become a spotlight issue? turned off some stock holders who now just see him as a squirmy little bald headed guy susceptible to the temptations of the human flesh and what else might he fall into all while at the helm of his playtoy? foolish man. Rexford - oh sooo true isn't it? Wenig would fire me 2 seconds after I told him what needed to change, people like him don't listen. @Marie - Poshmark is collecting and remitting sales tax for ALL states. As for Bezos comment -- he's right. He depends quite heavily on 3rd party sellers (like me) FBM&FBA. And he's in competition with Walmart to get those sellers. I just went to AMZ to find some corrugated boxes and couldn't find what I wanted. Then I went to WM to find boxes and couldn't find them. These are 3rd party suppliers to the sites. So I'll probably hit the stores like Staples (no 3rd parties) to get the box sizes I need. AMZ DOES treat sellers better. I just fired off a letter to EB after I received a "threat" that because my acct fell "below standard" they were going to a) close my acct; b) hold my Paypal money for 21 days; c) hide my listings from search. THREATS!!!! You won't see AMZ do that stupid stuff to its sellers.